The Skinny: A reincarnated Samurai and his lady fair fend off Yakuza zombies while attempting to prevent their leader from opening the portal to "the other side." "There are 666 portals that connect this world to the other side. These are concealed from all human beings. Somewhere in Japan exists the 444th portal.... The forest of resurrection." 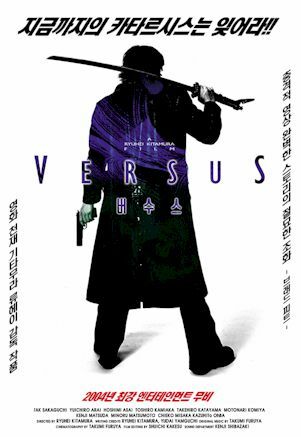 Versus begins with a samurai in Feudal Japan fending off a group of zombies. After defeating them, he finds himself in the middle of something bigger between their powerful human leader and a mysterious stranger. The kinetic energy of the opening duel provided by the constant swirling camera and fast editing sets the tone for the entire film. Flash forward to the same location, present day. Two escaped prisoners are on their way to meet with their unknown Yakuza benefactors. Prisoner KSC2-303, who is the only character given anything close to a name, is leery of the five gangsters they end up meeting. Why would they help total strangers break out of jail? At this point even the gangsters don't know. They're just following orders. Things heat up when the most flamboyant (and psychotic) of the Yakuza dislikes KSC2's attitude. As tensions rise, we discover that the Yakuza are holding a young lady hostage, and there is an instant connection between she and Prisoner KSC2. Violence erupts, several people end up dead (or in this case undead) and KSC2 and the woman end up fleeing together deeper into the forest of resurrection. Visually, Versus looks like a John Woo film on speed, and features attractive actors and actresses being treated to more glamour shots than you can point two pistols at. There are several wonderfully choreographed fight scenes, plenty of posing, outrageous gore and a lots of gunfights vs. zombies. One of the battles even has the zombies themselves firing the weapons! The effective techno soundtrack is reminiscent of Run Lola Run, with a classical Japanese influence added to the the scenes that take place in the past. Still, Versus does have its slow moments. And, it teases us not once, but three times with the promise of a spectacular swordplay showdown between the two antagonists. However, each time the action is taken in another direction. Then, when the battle does finally come to fruition, the director utilizes handheld camera work and tightly composed shots, which effectively obscures much of the action and even exposes some of the wire work. The story does take an interesting turn when the gangsters' boss reveals himself to be the superhuman leader of the undead from the opening of the film, who was bent on opening the 444th portal. KSC2 turns out to be his good-hearted brother and the kidnapped woman is KSC2's reincarnated lover whose blood holds the power to open the portal. Now it's all coming together…and then the film loses steam in the last act.